Apples are the bearing fruit of the Malus domestica tree. Part of the rose family, there is at least one variety of apple for every letter in the alphabet. Apples are grown and available year round because of seasonal changes. Fall is known as apple season when apples are ready to harvest from the trees. The earliest varity of apples, the Lodi, can be picked as early as mid-July with the latest apples including Fuji and Suncrisp ready to be picked in mid- to late October. The majority of apples from Gala to Red Delicious are ripe for picking in September. Whether apples are ready to harvest in which month is based on a variety of factors. The most important factor is weather, including winter, spring and summer conditions. 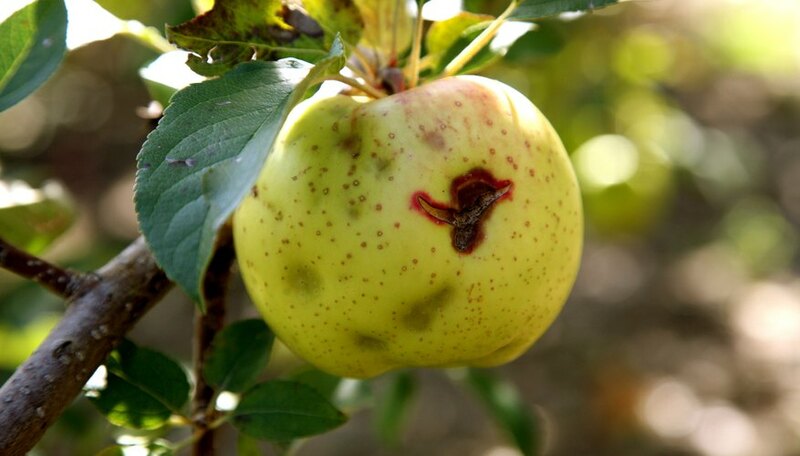 Other factors, including pests and disease, also can affect the yield of apples. A good growing season means apples may come earlier and in abundance, where a bad season means fewer apples later and at a higher price. You want to pick apples that are firm and crisp. Don't be fooled into thinking color determines ripeness. Your farmer should be able to tell you which ones are ripe if he knows when the tree flowered. Apples on the outside of the tree ripen first. To remove, roll up toward the branch till it snaps. Don't shake the branches or pull apples directly off.